The transition between seasons welcomes a new change and this new change invites a different way of life from the old season by entering afresh into the next season. Spring is a season of growth and new potential. In fact, spring is considered the king of all seasons. Of relevance, in the Bhagavad Gita – 11th chapter, Krishna while stating his strength says, “among all the trees I am the sacred pippala [Bodhi tree] and of the season – I am Spring.” This is because spring is the season in which all of nature wakes up as the birds sing, flowers bloom, and people generally feel energized as we emerge from winter. In essence, spring is a time of growth and a time to begin a new lifestyle. However, before adapting to a new way of life, we must first appreciate the qualities of spring and adapt in accordance. Spring can be likened to the freshness of water from the recently melted snow of winter. Because of this, there is still much moisture in the atmosphere and kapha [which is primarily water and earth] tends to be aggravated during spring season. As a result of all this moisture, excess accumulation of kapha within the body begins to liquefy and run out of the body as many people experience “spring fever” and allergies this time of year. It is a known fact that spring is the time of year for seasonal allergies. As the trees start to bloom and the pollen is released into the atmosphere, allergy sufferers begin their annual ritual of sniffling and sneezing. Each year, 58 million Americans fall prey to seasonal allergic rhinitis, more commonly known as “hay fever”. Furthermore, during spring the climate gets warmer and the heat reduces the digestive power of body. As a result, kapha increases which leads to various conditions like cough, cold, allergies, sinusitis, and indigestion to name a few. Ayurveda, the ancient science of life, has the solution. Ayurveda explains the concept of Ritucharya. In Sanskrit, the word “Ritu” means “seasons” and the word charya means “to follow a routine”. Hence, Ritucharya is the Seasonal Routine and by following a seasonal lifestyle & diet routine, people can prevent certain seasonal ailments and can ultimately have a healthy life . 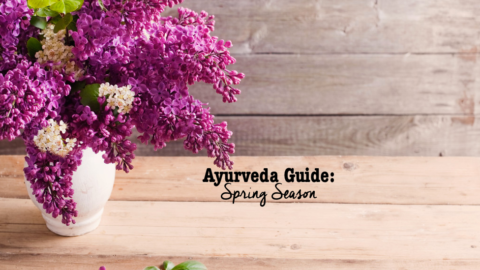 As per Ayurveda, the duration from mid-March to mid-May constitutes the Vasant Ritu or Spring season. Onions. They contain quercetin, a nutrient that breaks up mucus in your head and chest while boosting your immune system.When the smell of raw onions makes your nose run and your eyes tear up, this stimulates your immune system to fight infection. Onions also contain allicin which slows down and kills a variety of viruses and bacteria. The pungency of onions increases your blood circulation and makes you sweat. This effect is helpful during cold weather to prevent infections and to sweat out a cold or flu. Horseradish. Horseradish strengthens your immune system and increases blood flow to parts of your body irritated by cold and flu infections to remove wastes. This pungent food encourages you to flush out infected fluids through sweat and increased urination.